From a book of the same name by Dymax Publishing Co.; copyright © 1980 Dymax. Permission to reprint by teachers for classroom use is granted. It's true. RND numbers are greater than zero and less than one. Another way to say it: RND numbers are decimal fractions between 0 and 1. But what if we want random integers from 1 to 6 (as in rolling a die) or random digits (0,1,2,3,4,5,6,7,8,9) or random integers from 1 to 100? Well, if RND(1) is a number between 0 and 1, then 10 times RND(l) must be a number between 0 and 10. OK? Hmmm ... not so sure? Try this program. Here is a sample run. Yes, all 16 numbers are between 0 and 10. In the above sample the smallest number is .0878570662 and the largest number is 9.78314249. Now, think of each number as having an integer part to the left of the decimal point and a fractional part to the right of the decimal point. Here is a program to print random digits. Each number printed will be a single digit, 0 or 1 or 2 or 3 or 4 or 5 or 6 or 7 or 8 or 9. The random digit is computed and printed in line 220. A sample run might look like this. Do you understand how the program works? The key is line 220. RND(1) is a number between 0 and 1. 10*RND(1) is a number between 0 and 10. The integer part of 10*RND(1) is a single digit, 0 through 9. Aha! INT(10(RND(1)) is a single digit, 0 through 9. Beware! This one is tricky (but you can do it). For each RND number between 0 and 10, the integer (whole number) part is a single digit. So, let's tell the PET to keep the integer part and get rid of the fractional part. Here's how. We will use the INT function. In case you are not already familiar with the INT function, here are some examples. For positive numbers, the INT function gives the integer part of the number and throws away the fractional part. Exercise 5. Complete the following. What happens if you ask the PET to compute the INT of a negative number? Try it and find out. Exercise 6. 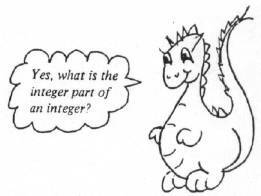 Show how to rewrite line 220 to get integers in each range shown. Hmmm . . . suppose we want to simulate (imitate) rolling dice. We need integer RND numbers from 1 to 6, inclusive (1 or 2 or 3 or 4 or 5 or 6). Let's see now, how does that work? INT(6*RND(1)) is an integer, 0 to 5. INT(6*RND(1)) + 1 is an integer, 1 to 6. In our program on page 9, change line 220 as shown above. Also, change line 120, as follows. Go ahead — try it. Here's what happened when we did it. Show how to rewrite line 220 to get integers in each range shown. The next two are tricky! Let's ask the PET to flip a coin for us. Well, actually let's ask the PET to simulate (imitate) flipping a coin. Here is one program to simulate flipping a coin. We got six HEADS and four TAILS. RUN the program several times, using various numbers of flips. Count the HEADS and TAILS each time. When we flip a coin, we expect that HEADS and TAILS are equally probable. That is, we are as likely to get HEADS as TAILS. We also expect that, if we flip a coin many times, the number of HEADS and the number of TAILS will be about the same. Let's modify our program so that the PET counts the HEADS and TAILS. In the following program, we have added lines 300 through 320, changed lines 430 and 440, and added lines 500 and 510. 510 PRINT "I GOT" H "HEADS AND" T "TAILS." Now a RUN will show the actual "flips" on the screen, followed by the number of HEADS and the number of TAILS. How does the program work? In line 420, COIN will be either 0 or 1. If COIN is 0, then line 430 will cause TAILS to be printed and the value of T to be increased by 1. If COIN is 0, all of this is done. If COIN is not 0, none of this is done. If COIN is 1, then line 440 will cause HEADS to be printed and the value of H will be increased by 1. If COIN is 1, all of this is done. If COIN is not 1, none of this is done. This program is OK for small samples. However, if you ask the PET for a larger sample (for example, 1000. flips) then alas, only part of the sample will be on the screen along with the number of HEADS and the number of TAILS. 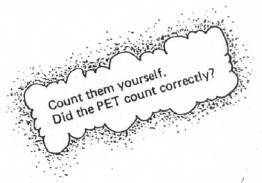 So, instead of printing HEADS or TAILS on the screen, let's tell the PET to "flip" a COIN N times and count (but don't print) the number of HEADS and the number of TAILS. Exercise 8. Complete the following program to flip a coin N times and count the HEADS and TAILS. ←Go back for another bunch of flips. I GOT 53 HEADS AND 47 TAILS. I GOT 45 HEADS AND 55 TAILS. I GOT 506 HEADS AND 494 TAILS. Remember. With this program, the PET is actually simulating the coin flips, but is not printing the result of each flip. Instead, it counts the number of HEADS and the number of TAILS and, after doing the required number of flips, prints the results. Exercise 9. Write a program to simulate flipping two coins. For a single toss, there are four possible outcomes. Here is a RUN of our program to flip two coins at a time. Exercise 10. Instead of printing the results (HH or HT or TH or TT), count them. Write a program to flip two coins N times, then print the number of times they came up HH, HT, TH and TT. Below is a sample RUN, showing how we would like to see the results.